Among the signs of the epoch we have now entered belongs the increased intrusion of danger into daily life. There is no accident concealing itself behind this fact but a comprehensive change of the inner and outer world. 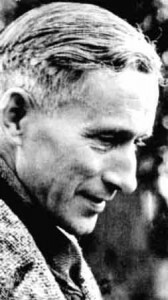 Published: November 3, 2010 | This entry was posted in North American New Right and tagged articles, bourgeois society, Ernst Junger, modernity, North American New Right, reprints, translations. Both comments and trackbacks are currently closed. Der Spiegel (date 11/03/2010) has a fascinating article on Jünger’s newly published WWI diaries.